So now we have the unveiling of Sen. Lieberman’s and Sen. Coburn’s plan to “Save Medicare and Reduce the Debt“. Lots and lots of people like it. It’s got plenty of cost-shifting onto the elderly, which I think is a bad idea . It totally requires the PPACA to remain in place so that 65-67 years olds can get insurance, which is ironic, since half of the “bipartisan support” wants to scrap that law. And it once again supports the idea of raising the eligibility age for Medicare. This is a good time to cross-post my last column for CNN.com: “Life expectancy deceptive issue in Medicare debate”. Should we control the spiraling cost of Medicare by raising its eligibility age from 65 to 67 or more? Many have argued that we should, because, they say, life expectancy today is much higher than when Medicare was created. The program was never designed to last so many years per person, and so, perhaps, people should retire later. The Congressional Budget Office has estimated that raising the eligibility age of Medicare to 67 would save about $125 billion through 2021 alone. That sounds like a great deal. However, the CBO doesn’t say that health care costs will go down overall, or that this money won’t have to be spent by others. It will. Let’s say you think this is OK, however. Perhaps you believe that, up until Medicare kicks in, you should be responsible for your health care costs. The question then becomes, is it reasonable to ask seniors to wait longer for Medicare because people are living so much longer? The problem is, life expectancy is complicated. General life expectancy, or life expectancy at birth, is mostly affected by early death. Whenever a child dies, it skews life expectancy from birth way down. Anything that increases infant mortality, or care that ends a potentially devastating childhood illness (think vaccines), will increase general life expectancy a lot. Therefore, many of the gains in overall life expectancy have nothing to do with how long an elderly person lives, but how well we do in treating childhood illnesses. What we really should care about in this case is not life expectancy at birth, but life expectancy at age 65. In other words, if you make it to 65, how long will you be on Medicare? That’s when things get tricky. First, if you made it to 65, even back in 1950, you could expect to be on Social Security for 14 years. In 1970, if you made it to 65 and qualified for Medicare, you could expect to live for about 15 years on the program. So a lot of people were making use of these programs, for a lot of years. In 1987, you could expect about 17 years on Medicare; by 2007, almost 19 years. Change in life expectancy is so uneven that within some states there is now a decade difference between the counties with the longest lives and those with the shortest. States such as Arizona, Florida, Virginia, and Georgia have seen counties leap forward more than five years from 1987 to 2007 while nearby counties stagnate or even lose years of life expectancy. In Arizona, Yuma County’s average life expectancy for men increased 8.5 years, nearly twice the national average, while neighboring La Paz County lost a full year of life expectancy, the steepest drop nationwide. Nationally, life expectancy increased 4.3 years for men and 2.4 years for women between 1987 and 2007. 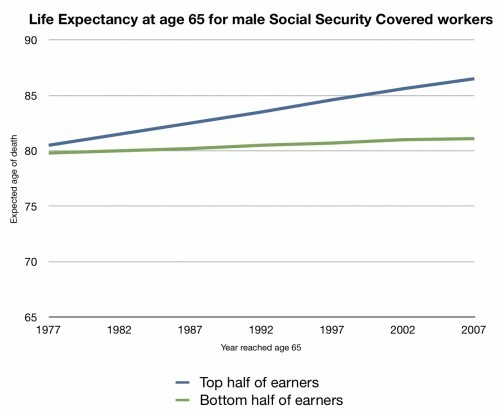 This is the life expectancy of a covered male Social Security worker who reached age 65 in 1977-2007. The blue line is the top 50% of earners; the red line is the bottom 50%. While earners in the top half have seen an increase of their life expectancy at 65 rise about five years over these three decades, the bottom half saw their life expectancy at 65 rise barely a year. This is what you should think about whenever someone talks about increasing the eligibility age for Medicare or Social Security. Not everyone’s life expectancy is increasing. Those who need the benefits the most would be the ones who stand to lose the biggest percentage of them by raising the eligibility age. Asking them to pay more out-of pocket doesn’t seem like a fair, nor workable, solution. Thanks for the Life Expectancy at 65 graph; it’s clear and simple. Lieberman and Coburn must know what their plan will do is simply to shift cost; but they did it anyway. So the argument here again is whether government should bear bigger or smaller role in health care. To win this argument, perhaps we should also point out that by shifting cost, the total health care cost may actually go up even more. I don’t understand what point you’re trying to make. There are differences in life expectancy gains by income, so it’s unfair to raise the enrollment age. But doesn’t that problem exist with or without raising the enrollment age? Low income people have fewer years of coverage either way. I’ll be eligible for Medicare later this year. I believe some</b? cost-shifting onto the elderly is fair, reasonable, and justified. Medicare benefits should be means tested. Yes, basic health care for all is the goal, but why should the middle and upper-income “elderly” be immune from the costs? As Austin point out in another post, “this is not your grandfather’s old age” — neither with regard to health nor to poverty. I think the elderly are already sharing the cost based on their income. For 2011 new Part B enrollees, the premium can be $115.40 per month, or $369.10 per month if they are richer. I think some European countries give retirement benefits to manual workers earlier than to others. After the response from the initial Lieberman roll out of his Medicare plan with respect to raising the eligibility age one would have thought that even a not-very-bright politician would have dropped the idea, because it was obscuring his main points. One would have been wrong. If you leave the age of eligibility issue out of the equation, exactly how do you propose to have the cost burdens of health care for senior distributed? Unless the system is changed, those cost burdens will increase. Someone will have to shoulder them. If you did not know who proposed the changes, and someone said “let’s increase payroll costs on high income individuals and lets increase Medicare premiums for middle to high income recipients and this will put the program on a sound basis for many decades to come” might you not think that is a reasonable idea? Not saying you have to agree with it, just is it a reasonable concept? And if you do not end Medicare, as Ryan proposes, and if you do not increase premiums and if you do not increase payroll taxes how do you manage the issue of who is paying? The alternatives left are (1) cutting payments to health care providers and (2) funding the system shortfall out of general revenues. Is that what people want? Seems like you are running out of options. I agree with the general point that the increase in life expectancy is not a big of driver of health expenditures as many would put it. I also agree that raising the eligibility age is not the right policy prescription here to deal with the issue of [rate of medicare cost increase] > [medicare revenue from payroll taxes]. However, just from an academic standpoint, I think looking at life expectancy after 65 is only part (and potentially misleading) of the picture. What we’re missing here is also the proportion of people who make it to 65 since the start of the program. The general idea is that for every person-year before 65, people pay into medicare, for every good for Americans) since the program inception and thus changes person-year after, people take out. On the same lines of more people surviving to age 1 or age 5, I would posit that more people are surviving past age 65. Unless you can show the life expectancy at age 18 (start of working age) has not changed, I would argue that the pay-in/take-out ratio has indeed changed to hurt medicare financing (but to medicare financing/benefits are needed. Again, minor point, but one of the sad distinctions in our political atmosphere is that some people can still hold a coherent thought while others cannot. I count on health economists being in the former camp, even if they’re drowned out by the idiots. That graph you showed here is also great for making the point for more progressive financing of medicare/means testing benefits. The 65-67 cohort are of course the healthiest group in Medicare. Dropping them will have a trvial effect on program spending. If the goal is to save serious money — and ignoring politics for a moment — we should spend less money on those over 85. We could say tomorrow morning that ICU days for those over 85 will be paid no differently than regular hospital days. We could say that heart and cancer surgery for those over 85 would be paid at the same rates as pneumonia. That is the sweet spot for cost control. How you communicate this and how you fight the hospital lobby are very big questions. We may need to re-define the goal of health care as the relief of pain. rather than the prevention of death. I think we do have enough money to give people morphine and send them to hospices. We may not have enough money to keep saving their lives with medical interventions.